January in a Glimpse: From the Flooded Camp to a Surprise Visit! Since the New Year and the exciting news of Atsuko’s birth, work in Batikap is returning to normal. 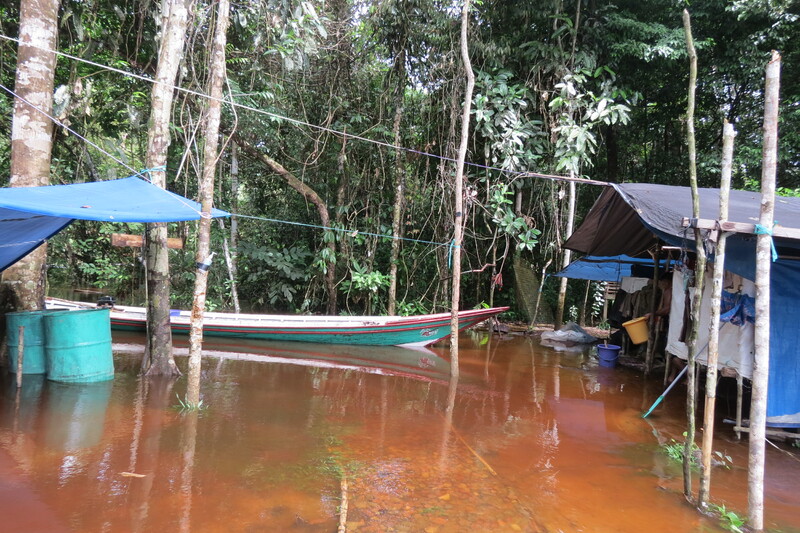 The year started with a flash-flood on New Years Eve, inundating the whole camp. Luckily we managed to get all our equipment and supplies on to table-tops before the water level peaked around 8am. Many of our team turned to their villages for an extended break over the Christmas period, to visit family, recharge their batteries and in Joy’s case, to get married! but now we are back to full-strength in Camp Totatjaro. The monitoring team have focused on our main task of finding each of the 44 orangutans we have released into Batikap. We try and see each of them as regularly as possible to make sure they are in good health, but this is easier for some orangutans than others. Astrid and Tarzan live close to camp so we often see them, but others live much further away and are usually only located by radio-tracking without a visual observation being made. Finding some of these orangutans takes a lot of effort. The year started with a flash-flood on New Years Eve, inundating the whole camp. Last week we sent a team to Camp Monnu at the far north of our release area, 1.5 hours by boat from the main camp, where they split up and searched for orangutans living up there. 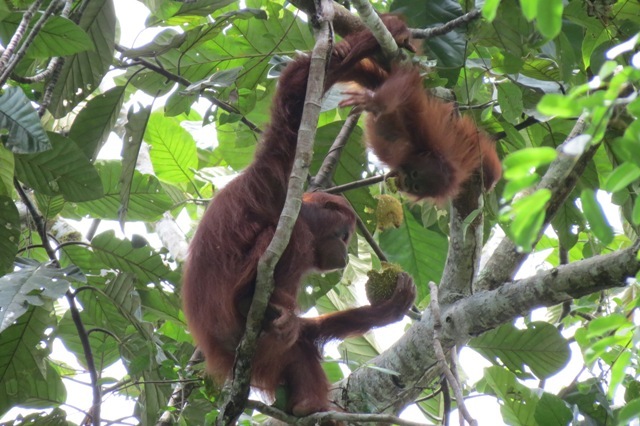 The first orangutans they were found were Jamiat and Gundul, feeding together in the same tree. This is close to where Gundul, a young female, was released, but 5km away from where Jamiat was released in November. 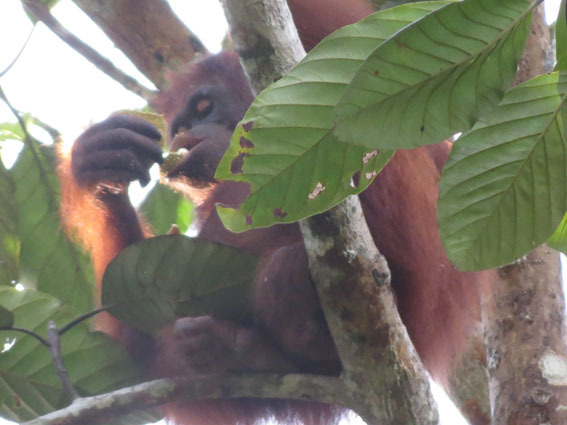 The next orangutan found was Giant, and later in the afternoon the large flanged male Sempung was seen and followed for a short while. This was the first time each of these four orangutans had been seen since their release, so this was particularly exciting for Sempung who was released last August. All four orangutans are in good health and all were a little aggressive to our observers, kiss-squeaking and shaking branches. As well as these sightings we heard long-calls from Maradona, another flanged adult male who seems to be asserting his dominance over the north of the release area in the same way that Tarzan is dominant in the south. We also picked up transmitter signals of Gusti, Paluy, Kopi, Chanel, Jamal and Iyos in this northern region. During January we have spent some time with four of the rehabilitant females and their offspring that we released in November. Sif, Gadis, Leonora and Emen have all been followed and data collected to assess their adaptation to their new wild environment. We are very pleased with their progress to date, they are eating well and for the most part staying high in the canopy and not approaching us when we observe them. Leonora still comes to the ground fairly regularly to forage and Emen occasionally likes to hang around near the river to see passing boats. A few days ago the team in camp were treated to the visit of Tarzan and Monic. They walked through the back of camp together before climbing a tree and feeding on fruit for the afternoon, then making their nests together at edge of camp. The team kept the noise down for the evening so not to disturb them! Tarzan is certainly keeping a close eye on Monic at the moment. Video of the 4th Orangutan Release is Available Now! 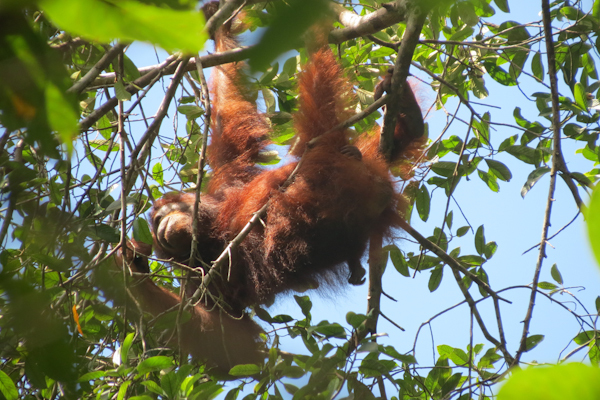 Finally, here is a video from Nyaru Menteng 4th Orangutan Release! You can also view this video directly on our Vimeo account. Just click here. On the last blog post, we shared the wonderful news of the arrival of Astrid’s new baby girl, Atsuko, and reported how Astrid was showing all the signs of being a great mother. Meanwhile Tarzan was observed near to Astrid over several days,traveling backwards and forwards to check on his new offspring. Unfortunately, at that time we didn’t have any photos of the new mother and her beautiful baby girl to share as had to wait for some of the field team to return from the forest. This morning, we received photos taken by our vet Fiet, and our technician Purnomo. They also shared the whole story of when and how they managed to take photos of this gorgeous baby girl and her happy new mother. According Fiet and Purnomo, on December 19, they started radio-tracking as usual to locate signals and subsequently follow and record observational data on our reintroduced orangutans. Close to transect Anton, they picked up frequency signals forAstrid, Tarzan, Monic and Menteng. Considering the fact that our monitoring team already strongly suspected Astrid was pregnant, Fiet and Purnomo followed Astrid’s signal towards the south-west. 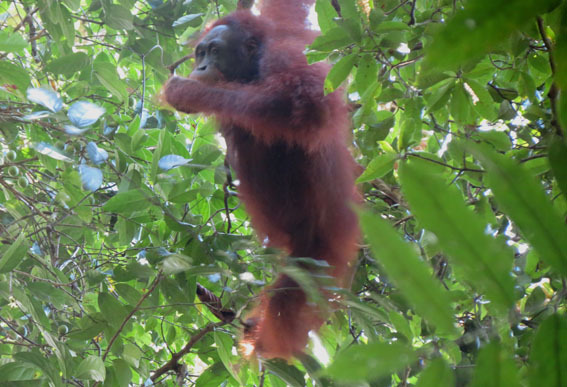 It took about one hour to find Astrid’s location, as Purnomo and Fiet had to walk off the transect through the thick understory of shrubs and rattan. Between transect 6 and transect Lone, the radio-tracking signal for Astrid was very strong, but Fiet and Purnomo still couldn’t pinpoint Astrid’s exact location. 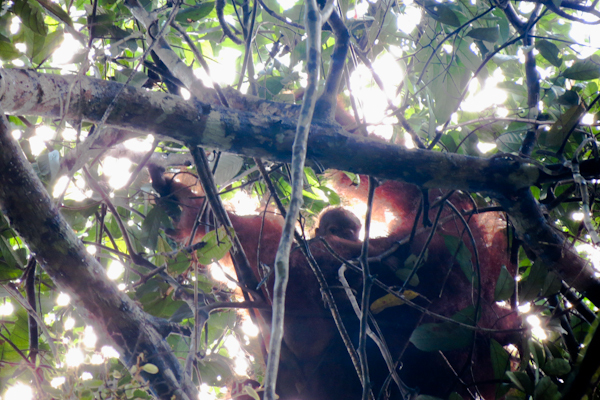 Luckily, Fiet and Purnomo heard Tarzan longcall at 9:22 am andsubsequent movements in a nearby tree. Underneath that tree, lay many fruit remains and when they looked up, voila… They saw Astrid eating Bondat fruits above. Fiet began to take photos of Astrid, while Purnomo commenced recorded data on Astrid’s activities that day (feeding, resting, etc.). At first, neither Fiet nor Purnomo has caught a glimpse of anything other than Astrid. However when they checked the photos, they saw a small head with beautiful dark eyes looking into the camera. Suddenly, they observed Astrid thoroughly, and they were sure that, indeed, Astrid was accompanied by a gorgeous baby orangutan. According to Fiet, even though she judged Astrid to have only given birth a few days before, Astrid was in great condition. The team believe that baby orangutan is Tarzan’s daughter based and Tarzan and Astrid’s courting history back when they were first released into Bukit Batikap conservation forest. We have named the baby Atsuko, and there is no doubt, that Astrid really is adoring of her new baby! Tarzan is also proving himself as a good and responsible father by patrolling around Astrid (15-20 meters) watching over and guarding Astrid and Atsuko. Tarzan made long call eight times that day, a good warning to other orangutans not to enter his territory. Despite the holiday season, our monitoring team in Batikap was busy during the Christmas and New Year break searching for and following the orangutans. The most important news is that Astrid and her baby are doing very well. The monitoring team finally could get close enough to find out that it’s a baby girl! We decided to call her Atsuko, based on a famous Japanese anime character created by Fujio Akatsuka in the early 60s. Those of you in Japan may be familiar with Atsuko Kagami, the little girl who was given a magical mirror that let her transform into anything she desires. 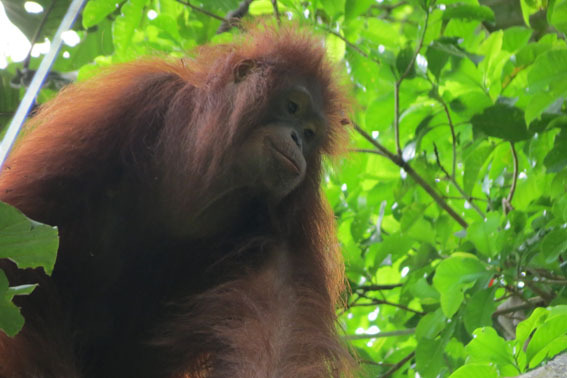 We certainly hope that our own little Atsuko can live freely and happily as any orangutan would desire in the wild forest. Meanwhile, Astrid is showing all the signs of being a great mum. Even though Atsuko is her first baby, she is very caring and knows what to do. She spends her days eating even more than usual and does not travel too much as there is an abundance of fruit in the forest at the moment meaning she does not have to search for food. 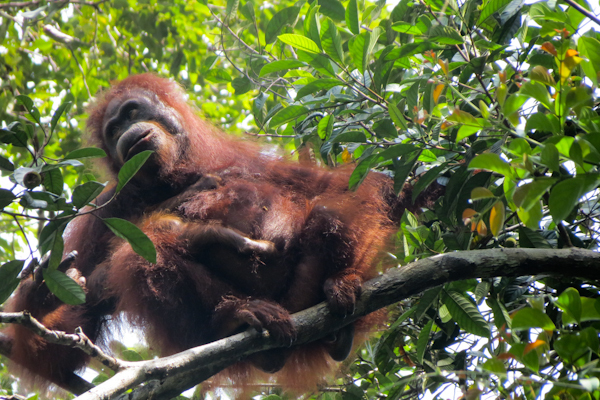 Tarzan was found near Astrid for several days and is still in the area traveling backwards and forwards to check on his new offspring. Unfortunately, we don’t have photos of this new happy forest family yet but will keep trying to capture one for all of you in the near future. Also Monic came to pay a visit to the new mum. The old gang got back together again but this time not for long. You may remember that after their release last February, Astrid and Monic stayed together for a long time and later Tarzan joined them and accompanied the two females for almost three weeks. That occurred in March/April 2012 and was obviously when Atsuko was conceived. However, this time, Tarzan was not too happy about Monic’s company and whenever she tried to get close to Astrid he chased her away. Paternal care does not generally occur in these solitary living apes, but Tarzan seems to be protecting either Astrid or Atsuko or even probably both. The Others are Doing Well, Too! 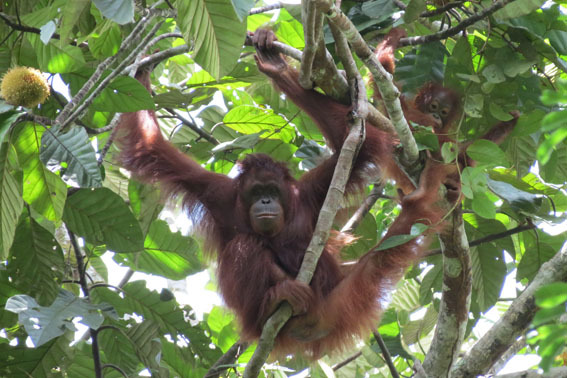 Other orangutans are also doing very well. Chanel, Leonora, Emen and other females are seen regularly and are adapting well to their new environment. Males namely Jamiat, Terusan and Menteng have moved away to explore the forest. Probably one of the reasons for this is Tarzan’s presence. Our team is also exploring new areas of the forest and climbing hills from where we record orangutan’s presence thanks to the radio-tracking equipment. Among others we recently picked up Sempung’s signal after a long break. Even though we still carry on monitoring activities it is slightly more difficult now in the middle of a rainy season. We do not only get wet while in the forest but recently also at camp. Our camp, so far dry and safe even during long and intensive storms finally flooded. We expected that it may happen one day and so it did on the very first day of 2013. It was fun to be able to get out from the boat straight into a bed but we are still looking forward to the dry season. 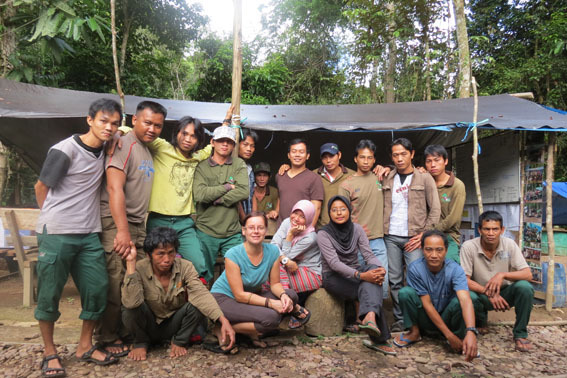 Happy New Year from the Post-Release Monitoring Team in Batikap! 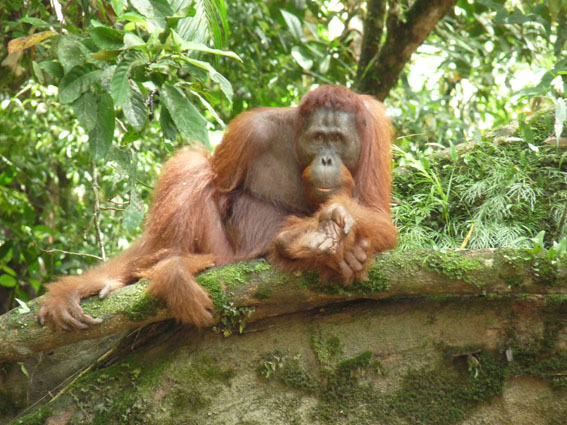 We all hope the New Year will be as good if not better for our old, new and to be released orangutans. All monitoring team members wish you all a very happy New Year! Bye Mum! Bye Friends! I’m Off for My Adventure!